This very well priced, very popular Executive high-back chair features a mesh back, mesh fabric seat and ergonomically designed high back that fits the natural curvature of a person's back. Seat height from floor adjusts from 17" to 21" to accommodate different height people. Also the arms adjust in height and width. Fits anybody. 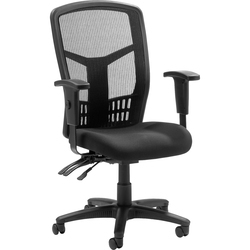 High-back chair offers a nylon five-star base, pneumatic seat-height adjustment, 360-degree swivel, tilt and asynchronous three-lever control. Weight capacity is 250 lb. High-back chair is available in black frame only, with a black or red seat. You will not be disappointed with this beautiful chair. We'll bring it and set it up for free and 5% of your purchase goes to the Canadian Red Cross Fires Appeal for the people of Fort Mac. Together we can help. We love our new chairs. Thank you Calgary Business Supply.